While that risk is small, it’s not zero. A nation’s leaders have to prepare for the possibility of nuclear war, and their preparations have an economic impact. It seems right now is a particularly good time to think about this. North Korea celebrated US Labor Day weekend with its largest nuclear test yet. It was followed by a series of long-range missile tests, one of which flew directly over Japan. Placing a nuclear warhead on a missile in a way that it survives the trip and explodes on the intended target is a different matter. We don’t know if Kim Jong-un can or will do that, but we can’t rule it out either. At our Mauldin Economics Strategic Investment Conference back in May, geopolitical expert George Friedman said the US appeared to be planning a military strike against North Korea (learn more about North Korea’s strategy in Friedman’s free exclusive e-book, The World Explained in Maps). He may yet be right, even though the Trump administration seems to prefer economic sanctions so far. Meanwhile, South Korea and Japan are understandably nervous. Treaties obligate the US to defend both from attack... but will we if it means risking Seattle or San Francisco? More to the point, South Korea and Japan aren’t sure either. That means they must prepare to go it alone. Both are perfectly capable of building their own nuclear weapons if they wish. Call me an optimist, but I don’t expect open war—nuclear or otherwise. Instead, I think the region will simmer as it is now, with harsh rhetoric and occasional small skirmishes. All sides will build up for a war none of them want to fight. If this sounds familiar, you may have lived through the decades-long Cold War. Back then, we didn’t have to wonder if the USSR could strike the US with nuclear-tipped missiles; we knew they could. Yet life went on. Markets paid little attention. That kind of atmosphere is already returning to Europe, as Russia and NATO face off over Ukraine, the Baltic states, and elsewhere. Now we see similar tension in East Asia. If someone launches real missiles at real targets, all bets are off. Short of that, we can confidently predict higher defense spending for all countries involved. War is never good, but preparing for war can be good—if you are a defense contractor or someone investing in a defense contractor. They get paid whether anyone shoots or not. I’ve noted before that defense is the best all-weather stock sector. The companies that make weapons, planes, and other military equipment routinely demolish market benchmarks. 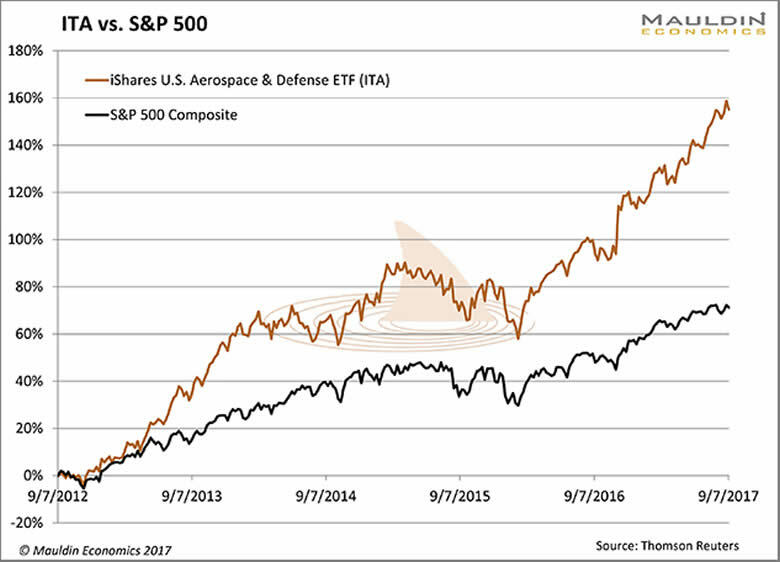 For instance, here is the iShares US Aerospace & Defense ETF (ITA) plotted against the S&P 500 over the last five years. The defense sector, as ITA defines it, didn’t just beat the market by a few points. Its total return doubled the market in the last five years. I’m not cherry-picking time periods here. You can run the same comparison for one year, 10 years, whatever range you want, and keep finding the same thing. The defense industry occasionally has a bad quarter or two, but over time it outperforms. Yes, I know: Past results don’t indicate future results. But some things just go with the human condition. People will keep eating… and governments will keep buying weapons.